Andreas Lambrou is a dangerous man. There he sits, along the wall near the entrance of every pen show: slightly under average height, with a generous, open smile. His Cypriate accent is ear-catching and has a lovely lilt to it that, did you not know his origin, would be hard to place. He is a walking font of knowledge about pens, as he literally wrote the book on fountain pens. Several of them, actually. He loves to talk about the hobby and share his knowledge and is just about the friendliest person you’ll ever meet. But underneath that sunny exterior is a predator. A predator who yearns to part you from your money in exchange for pens. And he’s really good at it. One must steel oneself before stopping at his table to chat, else one might find one’s wallet far emptier than when one approached. I know. 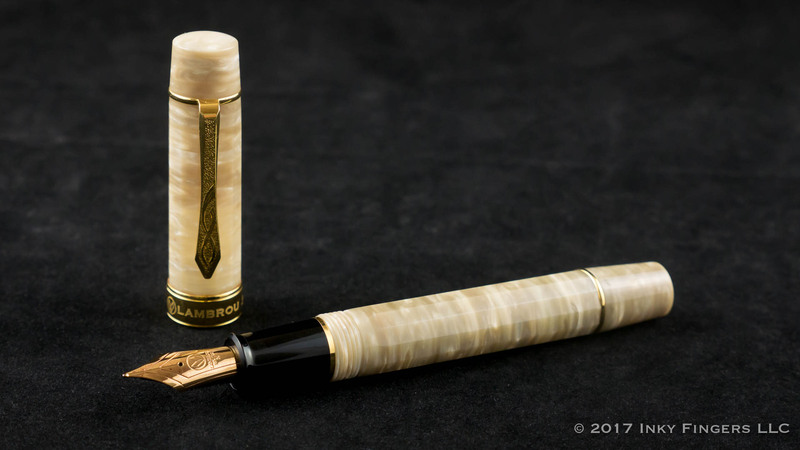 I learned the dangers of Andy Lambrou first-hand at my very first pen show, and I have never been the same. I jest, of course. (Mostly.) 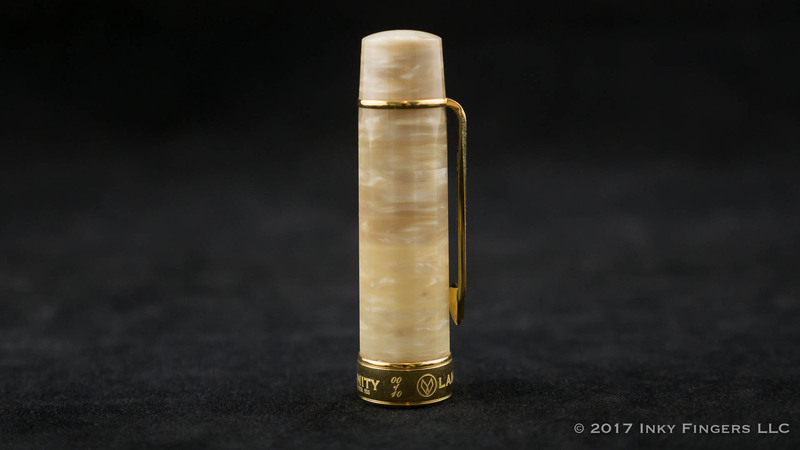 Andy is a fixture at pen shows, and the pens he sells through his company, Lambrou Pens (formerly Classic Pens) are among some of the most beautiful pens ever made. 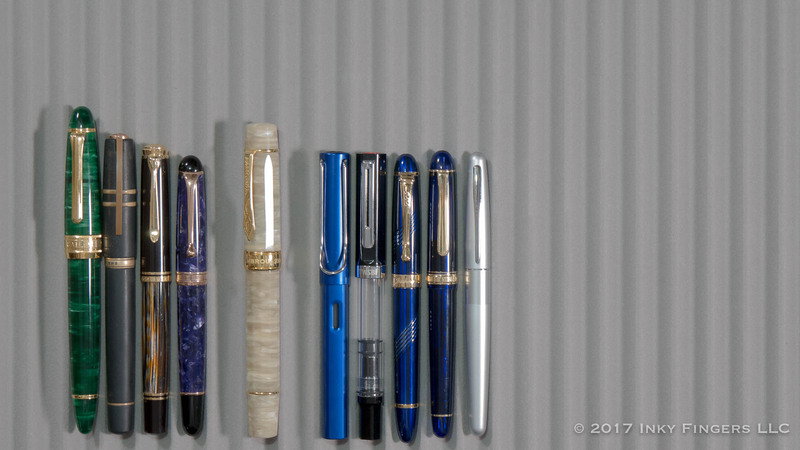 They are also very much among the high end of fountain pens. I’ve been seduced by Andy’s wares many-a-time. 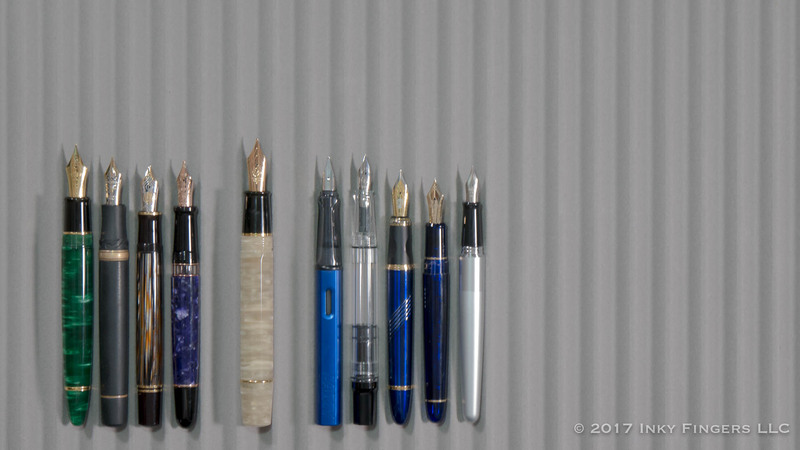 I own, or have owned, four of his LB5s (my favorite pen), an LM1 Red Flame, and the LB3 Jupiter. 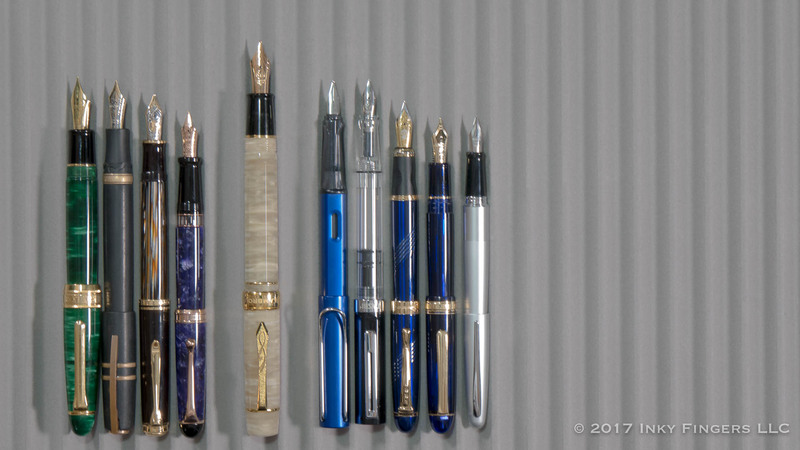 These pens represent a not-insignificant investment, as combined, the pens cost the same as a high-quality used car. I always have at least one of my LB5s inked at all times, and it is the pen I turn to whenever I want to really enjoy the writing experience. 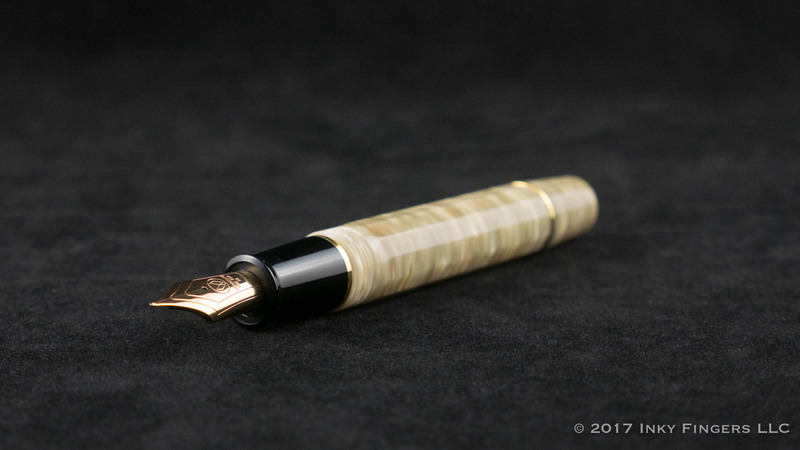 While attending the San Fran pen show this year, I girded up my loins and stopped by Andy’s table to say hello. He’s a lovely guy, and I always love chatting with him. And I’m not kidding when I say that he’s probably forgotten more about fountain pens than I will ever know; chatting with him is like sitting at the foot of the master. While there, he introduced me to the newest model of LB6 pen, Humanity. The LB6 is a line of large pens made of the diffusion-bonded acrylic that Lambrou Pens has popularized. Only 10 pens will be made in each color, and the purchaser has the choice between a pen with a round or a 12-sided faceted barrel. Each model is named after a virtue. (Passion: Red, Celestial: Blue, Integrity: Purple, Harmony: Green.) 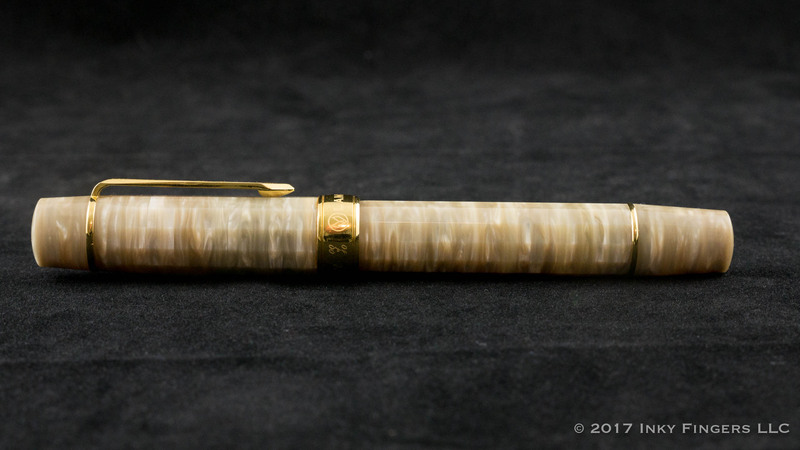 There is also a brown pen and the pen which I was lent to review: the Humanity pen, in the lovely marble white acrylic. The LB6 is a large pen. When capped it is slightly shorter than my much-beloved LB5. When uncapped, however, it is actually longer, due to how deeply the threads are placed on the barrel. It is quite a girthy pen, too, with the middle of section hitting 13.5mm. The LB6 line is handcrafted by pen artist Paul Rossi, who has collaborated with Lambrou Pens on several editions in the past. 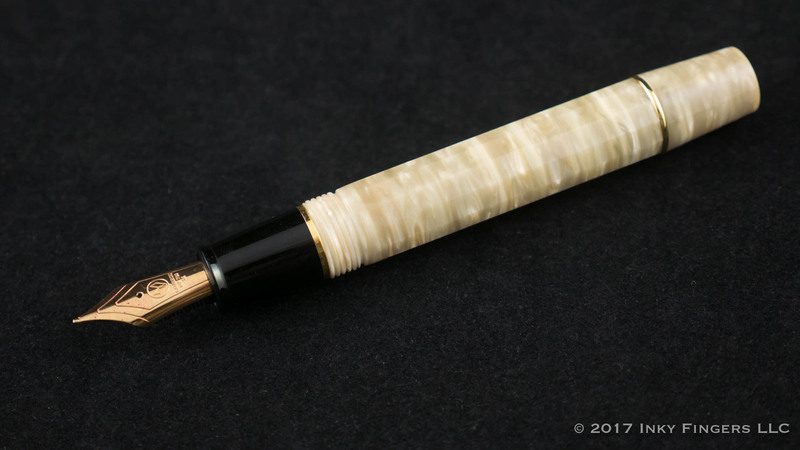 Paul’s work is among some of the highest-quality work being done today, and it shows in every detail of the pen’s construction. 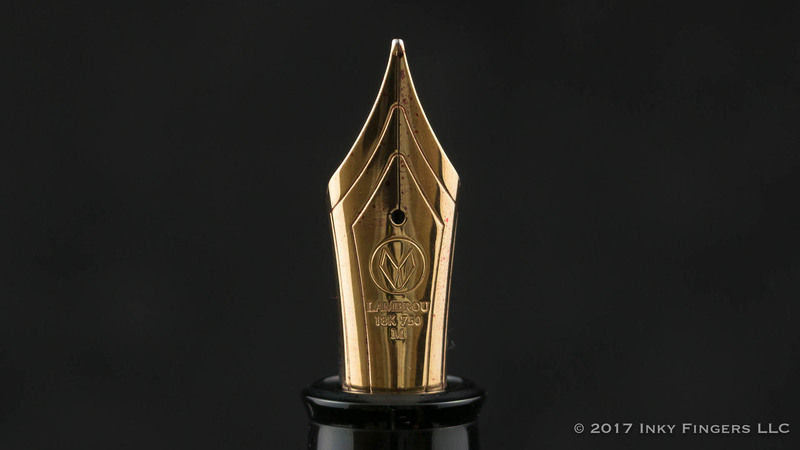 The pen’s cap is topped with a round finial that has an ever-so-slightly domed flat top. 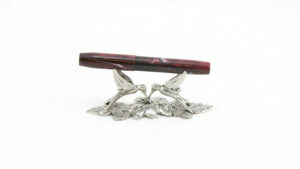 The finial holds the pen’s beautiful clip in place. The clip itself is a work of art. 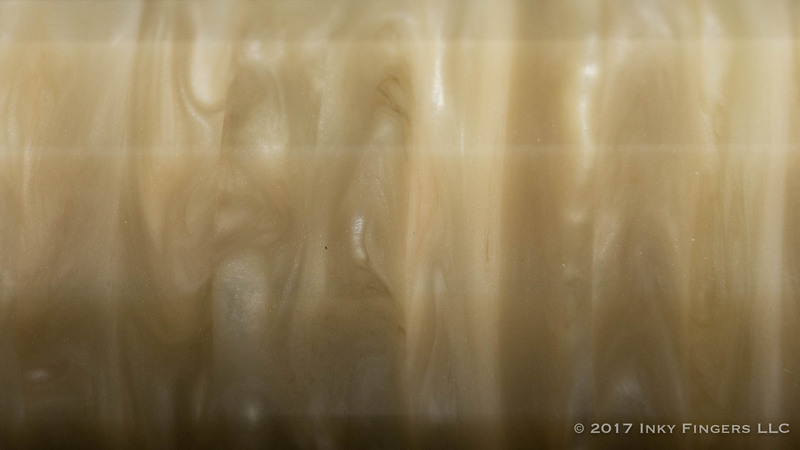 The profile of the clip reminds me somewhat of a men’s tie, but if it were chiseled from stone. The clip is yellow gold vermeil (sterling silver plated with 24k gold) and features a lovely textured design on the clip face. 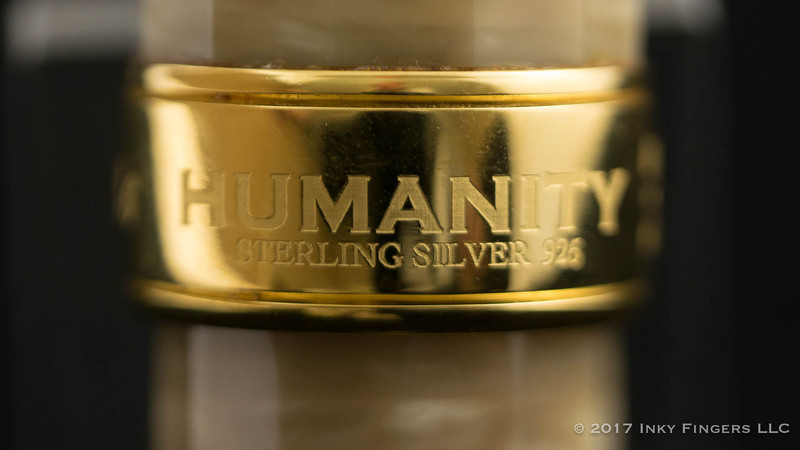 All of the LB6s have artwork on the clip, but the design on the Humanity is my favorite. It’s such a beautiful, sweeping figure on a pebbled background. It’s lovely. Andy spent some time with me explaining how the clip was created to give it its incredible strength and springiness. Silver hardware can be problematic, as silver is a relatively soft metal and often lacks the elasticity and tensile strength to function well as a clip. These clips are heat treated several times to strengthen the metal; the result is a clip that is very strong with a lovely spring, and very little danger of becoming malformed with basic use. It’s among the sturdiest silver clips I’ve ever seen. Under the clip ring is where faceting of the pen starts. The precision with which these facets are cut is quite astonishing. 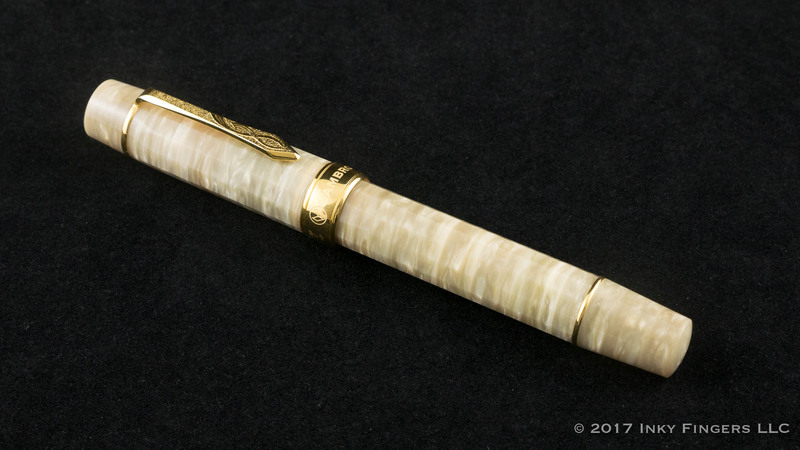 I don’t know that I’ve seen any other faceted pen on the market that is this precise…especially not on a handmade pen. 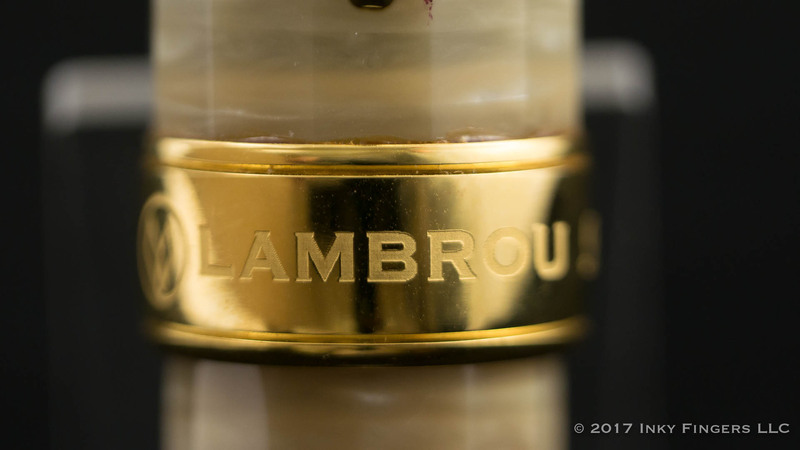 The cap terminates with a single, wide cap band of gold vermeil on which is engraved the Lambrou Pens logo, LB6, the model name (Humanity), and the pen’s limited edition number. 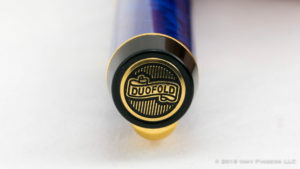 The barrel is faceted with the same 12-sided shape as the cap, and the facets line up well between the cap and barrel. 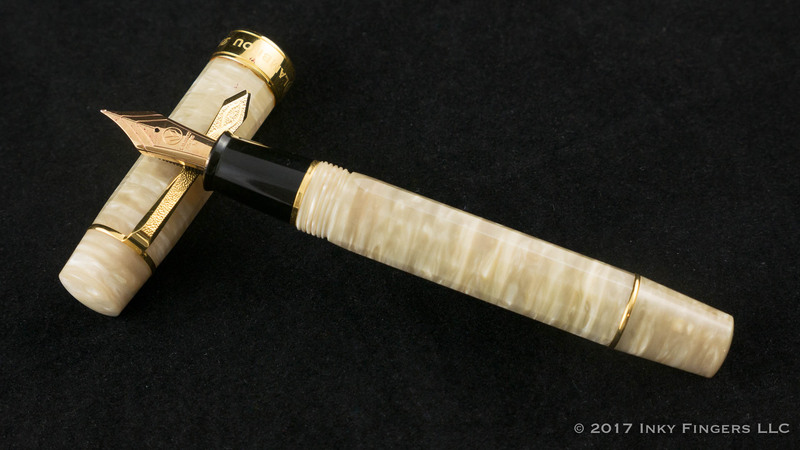 There is another thin washer toward the end of the barrel, and the entire pen terminates in a long, slightly tapering finial with the same domed, flat end. The cap twists off the barrel on liquid-smooth threads and takes 2.25 turns to remove. 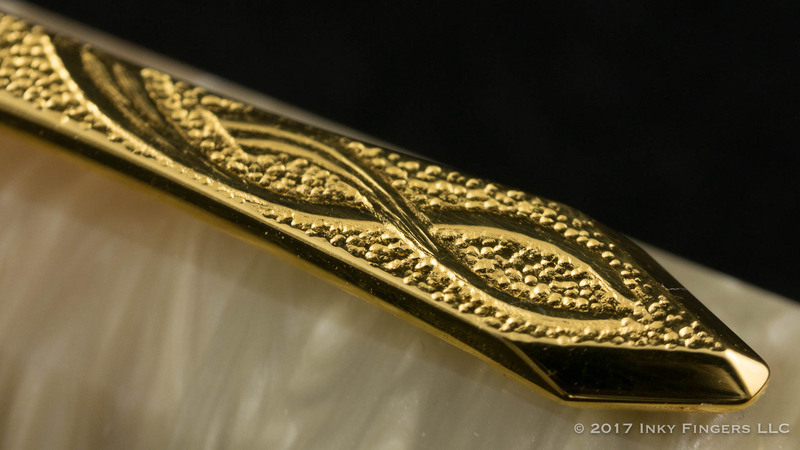 Under the cap is a longish, black section offset from the barrel threads by another gold ring. The section tapers and then flares out just before meeting the nib. 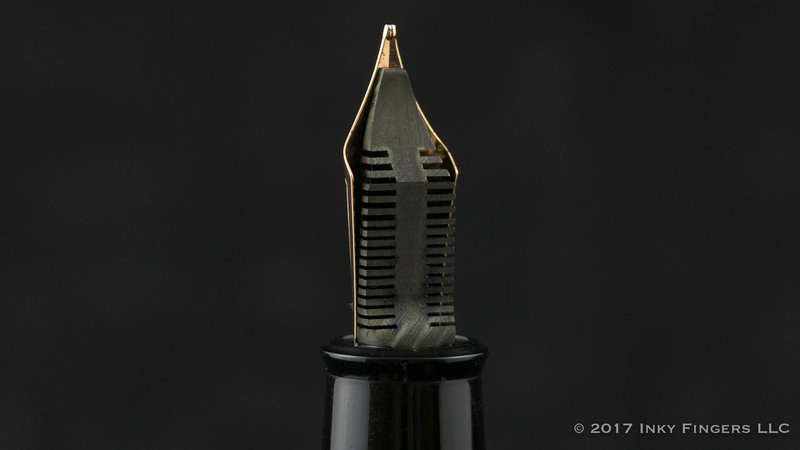 The nib on the LB6 is manufactured by A.G. Bock for Lambrou pens. 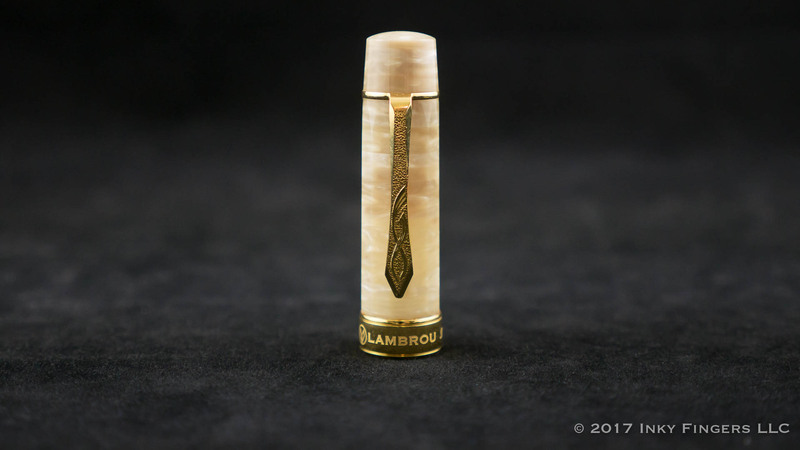 The 18k gold, #8-sized nib is stamped with a minimal Lambrou Pens logo design and the gold markings. 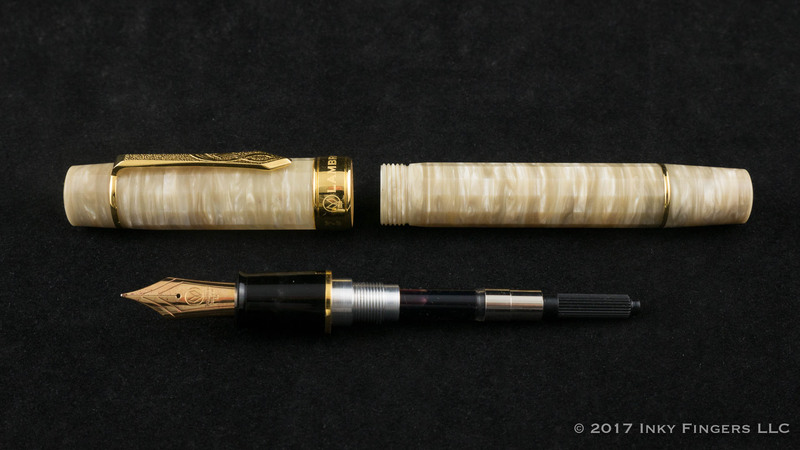 The nib is accompanied by an ebonite feed. The nib has just the hint of bounce to it but isn’t flexible or soft in any significant way. I actually consider this to be a good thing because a pen of this size would be very difficult use with a light enough touch for a truly bouncy or soft nib. There’s just enough give to feel cushioned, but not so much that people who prefer rigid nibs would likely find this nib distracting. Lest you think this is just some run-of-the-mill, stock, screw-in nib unit, however, let me dissuade you from that line of thinking. It’s clear that this nib has been perfectly adjusted. It also comes with an ebonite feed, which is less common than with many other Bock nibs. It’s very smooth, with almost no feedback against Rhodia or Tomoe River paper. It’s got a nice, slightly north of moderate ink flow which remains consistent for page after page of writing. 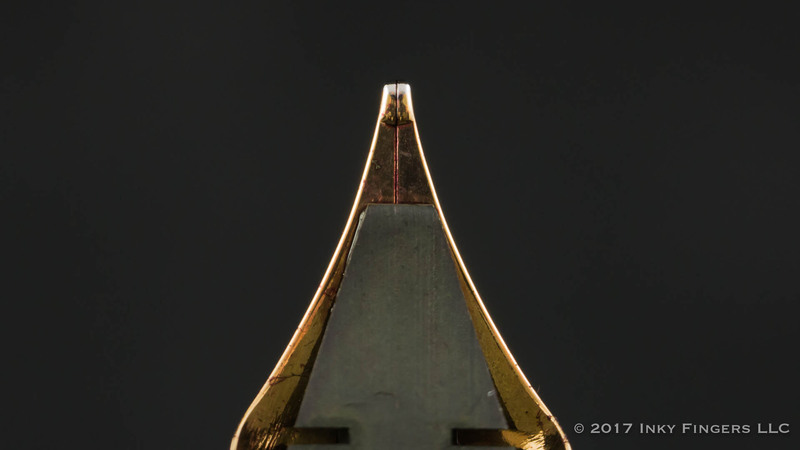 The nib requires only a whisper touch against the paper to leave a marking, and the nib’s medium gauge is true to size for a western nib. It’s a lovely, lovely writer. The LB6 Humanity is not, as you might expect, a cheap pen. 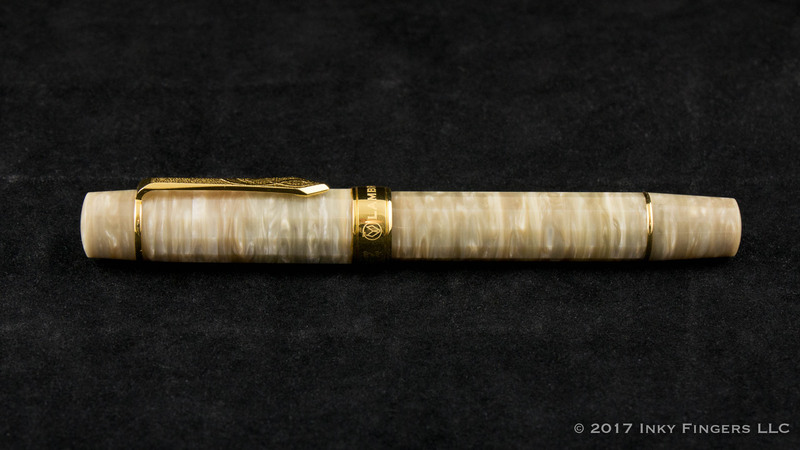 In fact, it is unquestionably the most expensive pen I’ve personally ever held/used. 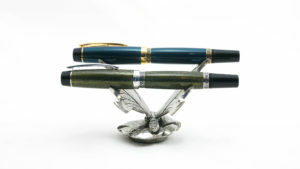 These pens have a retail price of between $2,800 and $3,200 based on whether you prefer round or faceted design (facets are more expensive) and whether the pen comes with Silver or Gold Vermeil hardware (the gold vermeil increases the price as well.) 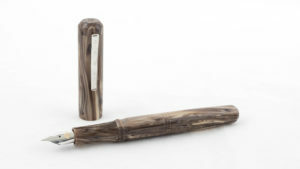 These pens are made on request and are only available via pre-order. Each pen takes 3-5 months to manufacture once the order has been placed. After having spent a few days with the Lambrou Pens LB6, I can honestly say that I love this pen. Was I not already so invested in the LB5s, I believe I could see myself lusting after these LB6 models just as easily. The feel in the hand is similar, the writing characteristics are different (with a Bock nib vs. a Sailor nib) but just as wonderful. The diffusion-bonded acrylics are, if possible, even more beautiful in the 12-sided faceted barrel, and the artwork on the clip is stunning. That being said, the $3200 price tag is much, even for me. I love these pens, but I feel like I would need to accomplish something extraordinary in order to justify purchasing it as a gift to myself. So, perhaps when I publish my first novel or if I ever get married, I will buy one of these lovelies for myself. Otherwise, they may just have to remain in the “I Wish” category. 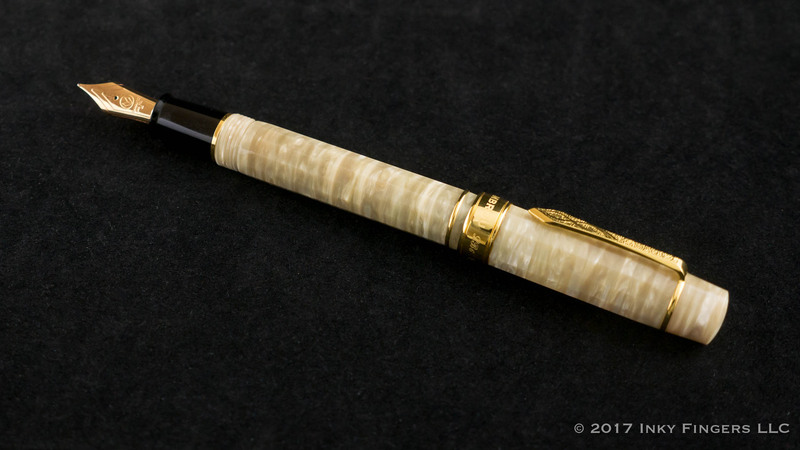 The pen for this review was loaned to me by Lambrou Pens and was returned after completion of the review. No additional compensation was provided. All opinions expressed herein are my own.